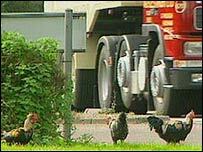 The rapid decline of a flock of wild chickens at a roundabout on a main road is blamed on people feeding them grain laced with rat poison. Birds have lived on the A143 junction at Ditchingham near Bungay on the Norfolk/Suffolk border for 50 years. At the height of the recent bird flu scare their numbers topped 200 but are now down to about half a dozen hens. Bungay resident Gordon Knowles, 75, has fed the chickens for 17 years and thinks rat poison is partly to blame. He said: "I saw one chap stop and feed the chickens and I think there was Warfarin mixed in with the wheat. "They are no trouble at all but there are not as many as there used to be." Deidre Shepherd who feed the flock said their numbers have fallen dramatically. She said: "That's sad for us and the children who come to see chickens living in the wild. "A piece of folk history is coming to an end."